The Cathedral has played a significant role in Edmonton’s history, a role that has its beginnings in a small settlement built on the banks of the North Saskatchewan River. The Parish of All Saints’ was founded in 1875 by The Reverend Canon William Newton, the first known Anglican missionary to the Edmonton area. Canon Newton built his first church, a home and a hospital in an area he called the Hermitage, now site of Hermitage Park in Northeast Edmonton. 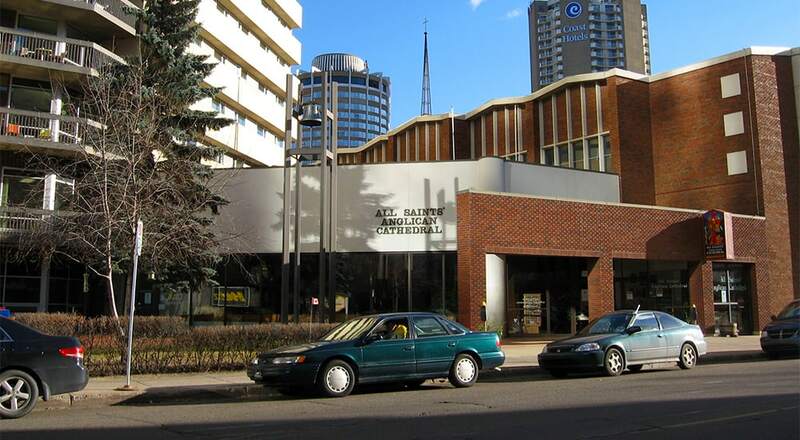 Eventually the parish moved to a site in downtown Edmonton. The Cathedral is the third All Saints’ church to occupy the present site. The first was erected in 1896. However, on December 20, 1919 disaster struck when a fire broke out that destroyed the church. After this disaster a start was made on a new Cathedral. A crypt was constructed and opened for worship in 1921. This served the congregation for thirty-four years as plans were made to build on the crypt; however, the foundations and walls were not strong enough to support a large structure and a new building was therefore necessary. The cornerstone of today’s All Saints’ Anglican Cathedral was laid in the November of 1955 and the church opened for worship the following year. The Cathedral was dedicated on Ascension Day May 10th 1956 and consecrated on All Saints’ Day in 1967. There are many memorials in the Cathedral serving as a repository of the history of Edmonton. One can find connections to Edmonton’s past with prominent names such as Griesbach, Secord and Allan Gray. There is the Oak Reredos, underneath the large stained glass window one sees upon entry to the Cathedral, dedicated to the men of the congregation who gave their lives during the First World War. The Reredos was moved from the old Cathedral when the present Cathedral was built. And there are simpler memorials such as the one to Capt. Thomas Wellington Chalmers killed in action during the Boer War, or the memorial to two sons killed in the sinking of the Lusitania in 1915. The historic fabric of people and things in the Cathedral help make the interior of the Cathedral an inviting space in which to worship. Among the elements for worship is the liturgy of music with the organ as a central piece. The Cathedral’s magnificent organ was installed in 1959, and built by Casavant Freres of St Hyacinthe Quebec. It has three manuals, forty speaking stops and 3,000 pipes, the smallest of which is the size of a pencil and the largest 16 feet long. The organ was totally refurbished in 2010. When you visit the Cathedral be sure to take a walking tour. You will find a brochure in the back of the church seats (pews) to guide you. The present building was open in 1956 and is constructed of steel and brick. The window frames and center of the west front are of granite. The light brick of the interior gives a feeling of warmth, and is a pleasant contrast to the copper pillars, which are actually steel supports encased in copper. The architecture is modern yet conservative. A discerning observer may detect a resemblance in plan to some of the smaller basilicas of the early church. This is however, superficial, for the long chancel in relation to the remaining length of the church is definitely in keeping with the more usual practice of ecclesiastical architecture. These proportions of the length of the chancel to that of the nave as well as that of the height are pleasing, as is the relatively plain interior with its lack of superfluous decoration. The upper part of each side of the chancel was designed with the specific purpose of accommodating the organ that is housed there. The High Altar was placed in a raised position in order for all members of the congregation to have the ability to view the proceedings of the service.